For questions or more information about any of our products and services, please email or call us at 877-843-0183. Our convenience store design and walk in cooler services are only the best! 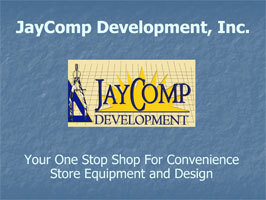 At JayCompDevelopment.com, convenience store design consultants, we are the convenience store floor plan design specialists. JayComp Development will work with you to combine your ideas with our tested and successful Design. We develop the plans to Offer Convenience Store Floor Plans, Convenience Store Site Plans, Convenience Store Elevations, Convenience Store Graphics, and we incorporate those designs with Design Build and Architectural Certifications. We will work directly with you to combine your concept of how you want your store to look with a traffic-sensitive design that ensures your new convenience store floor plan layout incorporates style and function equally. Your customers will be pleased to find everything they need quickly and easily, and you will be happy to see your profits soar. When you rely on JayCompDevelopment.com, convenience store designers, you are relying on a team of experts with more than 15 years experience creating convenience store design specs. We will develop your floor plan from concept to completion, and we guarantee satisfaction. Let us assist you in creating your convenience store floor plan diagram. With an effective convenience store diagram, you don’t need to focus your attention on matters like where to put the snack foods. You can keep you attention where it needs to be–-on running your business.